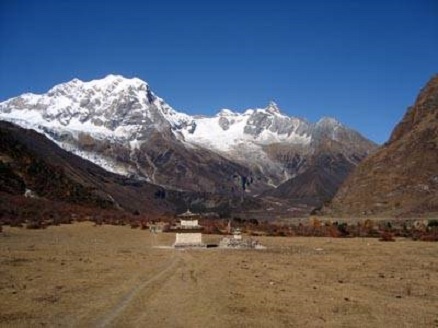 Manaslu region is a very preserved area and a beatiful valley. 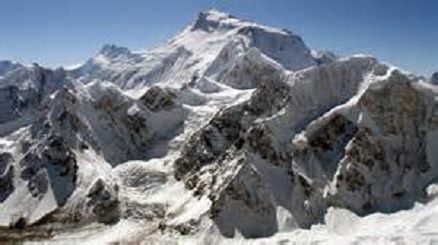 The route offers excellent views of Ganesh Himal range, Manaslu range and Annapurna range. 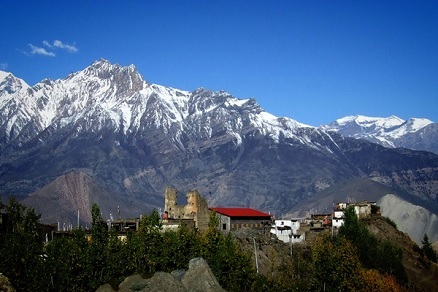 Trekking in this region provides views of the snow-covered mountains of the Himalayas. Manaslu is the eighth highest mountain in the world, is located in the Mansiri Himal and is situated in the West-central part of Nepal. 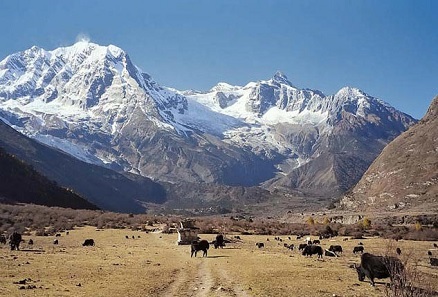 The region, which is also termed the Manaslu Conservation Area, comprises sub-tropical Himalayan foothills to arid Trans-Himalayan high pastures bordering Tibet. There are other major peaks in the region, namely Himalchuli (7 893 m), Ngadi Chuli (7 871 m), Shringi (7 187 m), Langpo (6 668) and Saula (6 235 m). 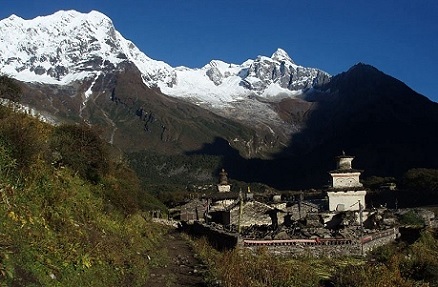 The Tsum sacred valley, virgin Himalayan pilgrimage is situated in Gorkha district. Starting from Arughat and extending into the Larkhe La pass, the area covers six climatic zones, so it is has a differsive flora and fauna. Unlike many other regions, this valley is a sanctuary to many highly endangered animals, including Snow Leopards and Pandas. Other mammals include Lynx, Himalayan Black Bear, Grey Wolf, Dhole, Assamese Monkey, Himalayan Musk Deer, Blue Sheep, Himalayan Tahr, Mainland Serow, Himalayan Goral, Wooly Hare, Horseshoe Bat, Himalayan House Hare, Black Lipped Pika. Overall, the presence of 19 types of forests and other forms of dominant vegetation have been recorded from the area. The Gurkhas from Gurungs ethnic are very famous for their bravery during military wars everywhere in the world. Closer to Tibet, the Bhutias (also spelt Bhotias), close to the Sherpa group, of Tibetan ethnicity dominate the scene as can be discerned from their flat roofed houses, and they are distinctly Buddhists. 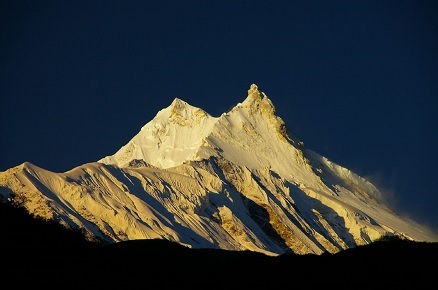 The Manaslu trek now usually starts in Arughat Bazaar and ends two to three weeks later in Besisahar. This trekking is a very popular trekking destination for camping autonomy and non-tourist area with its wild route along the beautiful Budigandaki river. 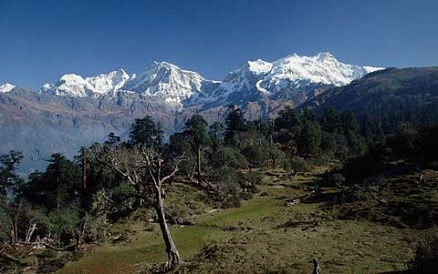 The route offers excellent views of Ganesh Himal range, Manaslu range and Annapurna range. - Day 1: Kathamandu to Arughat 608 m by bus (5-6 hrs). - Day 2: Arughat to Khorsani Bari 700 m (4-5 hrs). - Day 3: Khorsani Bari to Machhekhola 869 m (5-6 hrs). - Day 4: Machhekhola to Yarphuphat 1170 m (4-5 hrs). - Day 5: Yarphuphat to Philim 1570 m (5-6 hrs). - Day 6: Philim to Dang 2386 m (5-7 hrs). - Day 7: Dang to Ghap 2400 m (4-5 hrs). - Day 8: Ghap to Lho 3180 m (4-5 hrs). - Day 9: Lho to Samagaon 3520 m (4-5 hrs). - Day 10: rest day in Samagaon and side trek around Manaslu base camp. - Day 11: Samagaon to Samado 3875 m (3-4 hrs). - Day 12: Samado to Larkya pass Dharmasala 4460 m (4-5 hrs). - Day 13: Dharmasala to Bimthang via Larkya pass 5160 m (6-7 hrs). - Day 14: Bimthang to Tilij 2300 m (5-6 hrs). - Day 15: Tilij to Tal 1700 m (4-6 hrs). - Day 16: Tal to Beshishar by bus (4-5 hrs). - Day 17: Beshishar to Kathmandu by bus (5-6 hrs). 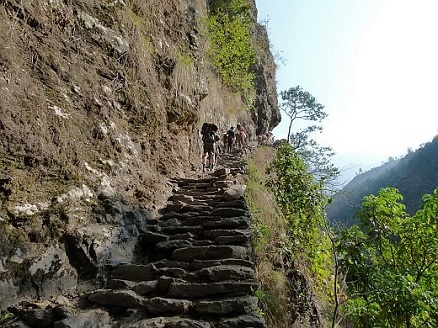 - Day 1 to Day 5: same as Manaslu trek. - Day 6: Philim to Chumling 2386 m (5-7 hrs). - Day 7: Chumling to Chhokang Paro 3031 m (4-5 hrs). 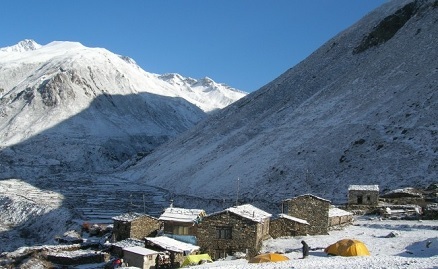 - Day 8: Chokang paro to Rachen Gompa 3240 m (4-5 hrs). - Day 9: Rachen Gompa to Mu Gompo 3370 m (4-5 hrs). - Day 10: rest day in Mu Gompo and side trek around. 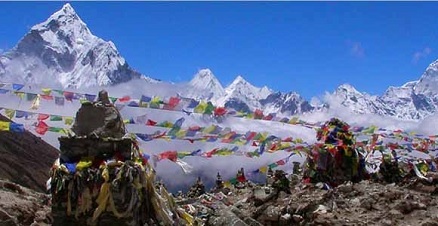 - Day 11: Mu Gompo to Domje 2460 m (5-6 hrs). - Day 12: Domje to Gompo Lungdang 3200 m (4-5 hrs). - Day 13: rest day in Gompo Lungdang and side trek to Ganesh Himal. - Day 14: Gompo Lungdang to Chumling 2386 m (4-5 hrs). - Day 15: Chumling to Dang 1860 m (5-6 hrs). - Day 16: Dang to Ghap 2400 m (4-5 hrs). - Day 17: Ghap to Lho 3180 m (4-5 hrs). - Day 18: Lho to Samagaon 3520 m (4-5 hrs). - Day 19: rest day in Samagaon and side trek around Manaslu base camp. - Day 20: Samagaon to Samado 3875 m (3-4 hrs). - Day 21: Samado to Larkya pass Dharmasala 4460 m (4-5 hrs). - Day 22: Dharmasala to Bimthang via Larkya pass 5160 m (6-7 hrs). - Day 23: Bimthang to Tilij 2300 m (5-6 hrs). - Day 24: Tilij to Tal 1700 m (4-6 hrs). - Day 25: Tal to Beshishar by bus (4-5 hrs). - Day 26: Beshishar to Kathmandu by bus (5-6 hrs). 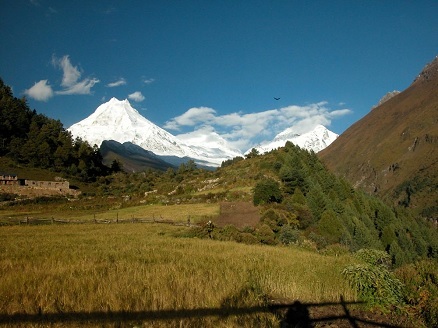 The Manaslu region is is much less crowded than the Annapurna as it is more difficult and the trail is steep. The highest altitude point of this trek is Larkya La pass 5240m, so it requires a good altitude acclimatization. The trek requires a Restricted Area Permit (fee per week). 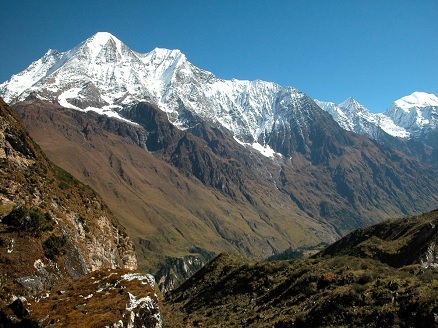 The Manaslu Conservation Area, has been declared as such in December 1998.